Mom has been on a kick lately. She's is always looking on the Internet for new restaurants for us to try, but she's made a new list of places that she wants to visit ASAP. 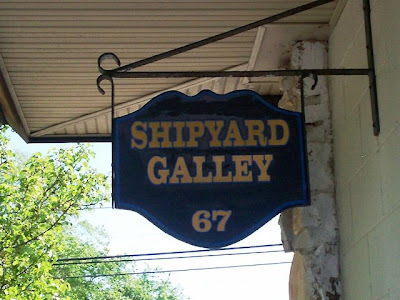 One of the places on the list was called Shipyard Galley. 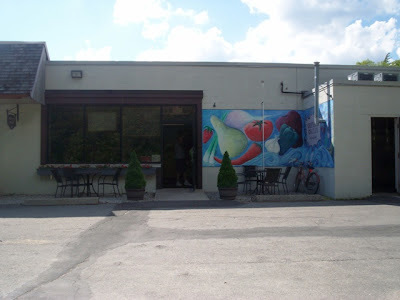 Shipyard is a food shop that serves fresh sandwiches, soups, and baked goods, but what they're famous for is their large selection of gourmet take out platters, cold cuts, Hors D'Oeuvres, and catering. It sounded great, so we made sure to check it out on our Saturday errand extravaganza. Located on the side of a small plaza, we pulled into the parking lot at about 4 p.m.
At Shipyard, it's all about the food. 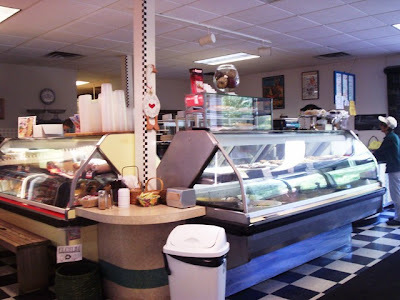 There are a few dining tables both inside and out of the extremely clean establishment, but the majority of the space is taken up with deli counters, refrigerators, and bakery display cases. That's fine with us! We love looking at food almost as much as we love eating it. Since we had just come from having lunch, Mom and I weren't interested in trying any of their food at the moment. Instead, we headed straight for the bakery counter. I would have taken a picture of the different breads and cookies on display, but there were too many people crowded around. 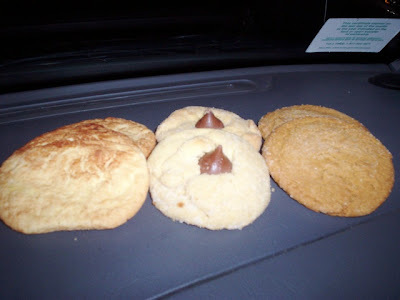 When Mom finally got a chance to order, she chose six homemade cookies - two peanut butter kisses (peanut butter cookies with Hershey's Kisses inside), two snickerdoodles, and two molasses. When we got a chance to visit the refrigerated cases, I saw the most delicious looking brownie ever. 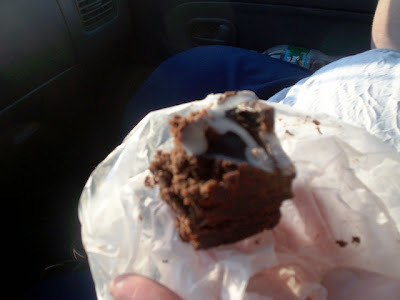 It was called a Mississippi Mud brownie ($2.95), and it was dark, fudgy, and had what looked like a marshmallow top. We, of course, grabbed one of those along with a lemon square ($1.50). Our total came to $8.35. When we got back to the car, we put the goodies in our freezer bag and went on our way. 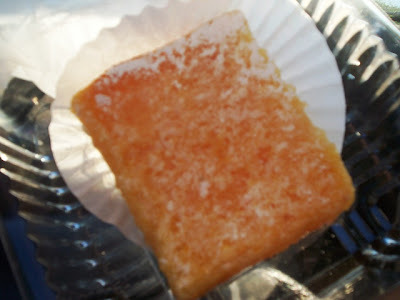 This lemon square reminded us of the one we used to get at the now-closed Esler's American Bakery in Marlboro, MA. 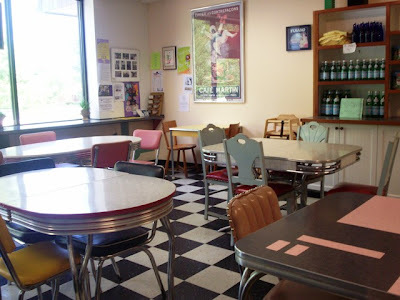 The square was nice and tart, which Mom and I both like, and had a cookie-like crust. It wasn't as big as the brownie, but perhaps that was a blessing because the tart taste may have been too overwhelming. If you like your lemon squares on the sweet side, you may not fall head-over-heels with this one. However, Mom and I thought it was excellent. Finally, when it was late at night and the actual errands (grocery shopping, etc.) had been completed, we were ready to chow down on the cookies. Who cares if we were still in the car ... and it was after 10 p.m. ... and we were in the parking lot of Stop & Shop? We pulled out the bag of cookies and tried the snickerdoodle first. When we got home, we had the peanut butter kiss and the molasses. You could definitely tell that the cookies were homemade by the smell, feel, size - just everything. Our favorite was the snickerdoodle, which you don't often see in bakeries. It had a nice texture and a great cinnamon flavor. They weren't soft cookies, and they had a nice snap to them without being too dry. The thick peanut butter cookie had a whole Hershey Kiss inside and the molasses one had a deep, rich flavor. They were all perfectly done. There were other flavors that we are looking forward to buying on our next visit to Shipyard Galley. The Shipyard Galley will make you drool. We peeked inside some of the refrigerated coolers that held the take-home food and started making plans to get certain things. I saw cucumber soup on their daily soup board ($3.25-7.95), and I haven't been able to get it off my mind. I'd love to try that, and I hope they have it when I go back. Specialty sandwiches range from $6.50-7.95, not including a peanut butter and jelly for $2.95. Now, judging by the price, I'm guessing that the calzones are for a family because the price is $16.95. Yikes! Their Hors D'Oeuvres list (from $8.95-16.95 per dozen) includes things like mini beef Wellington, baked stuffed mushrooms, shrimp cocktail, mini chicken Cordon Bleu, and strawberries dipped in chocolate. You can also order a platter of finger sandwiches ($15.95 per dozen), deli cold cut platters ($38-74), and a breakfast tray for $39.95 which includes assorted muffins, bear claws, and scones. According to their catering culinary take out menu, all of their entrees are in an oven ready 9x13" container and serves 8-12. Items include chicken Marbella ($39.95), apple-stuffed pork loin, Mediterranean chicken, and seafood lasagna ($59.95) which includes shrimp and scallops. Yes, the stuff sounds expensive, but when you are buying for a large group, you're saving money in the long run. Plus, the food is already prepared. Shipyard Galley also has a catering service available. Well, I'm hungry. Sometimes I can't stand it when I have to do reviews of restaurants that feature food that is so deliciously described. I can't take it! Perhaps Mom and I will stop into Shipyard Galley soon for a few sandwiches and, I hope, a cup of that cucumber soup. I can't wait! Shipyard Galley is open from 7 a.m. to 6 p.m. Tuesday through Friday, 7 a.m. to 5 p.m. on Saturday, and 7 a.m. to 3 p.m. on Sunday. They are closed on Monday.